Image Size: 23 X 30 in. Fort Phil Kearny, built in 1866, was one of a series of forts built at the height of the Indian Wars by the U.S. Army to protect travelers on the Bozeman Trail. This area, east of the Bighorn Mountains, played an important role during Red Cloud’s War. The Fetterman Massacre, in which 81 were killed only four miles from the fort, represented the greatest loss of life in a single battle by the U. S. prior to Custer’s Command at the Little Bighorn. The expansion of the Union Pacific Railroad enabled miners and travelers to reach Montana via Idaho and soon the Bozeman Trail, with all its dangers, became obsolete. The Army chose to abandon Fort Phil Kearny in 1868. Soon after the Army’s departure, Indian warriors burned the fort to the ground. Red Cloud’s War culminated in the Fort Laramie Treaty of 1868, a victory for the Indians who gained control over the Powder River country. Z.S. 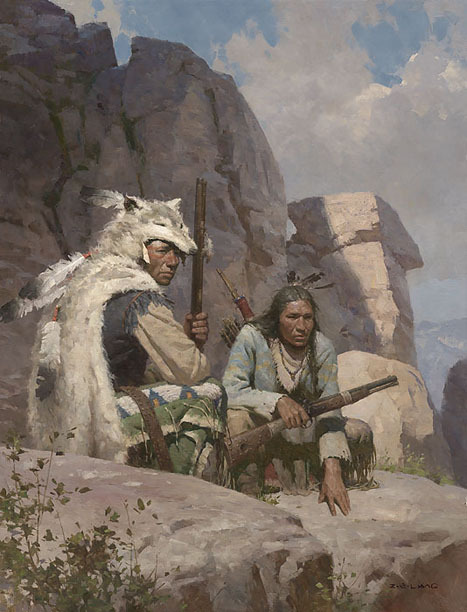 Liang’s "Observers Above Fort Kearny, 1868," depicts a pair of Lakota Sioux scouts watching the departure of the soldiers and other personnel from the frontier outpost. Liang is recognized as one of the most important painters today in the Western art world. This work was featured at the 2014 Masters of the American West Exhibition and Sale and his upcoming book "Native Trail, Fresh Tracks."